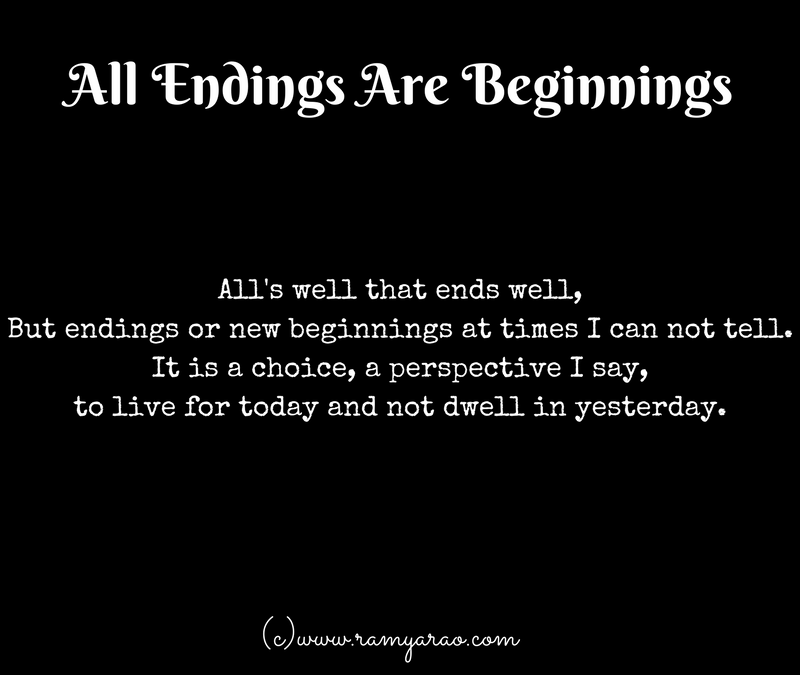 All endings are also beginnings. We just don’t know it at the time. Most of us are afraid of change, to me, it is scary. This is after telling myself multiple times that change is good, challenging and one of best ways to grow. Endings aka new beginnings are bittersweet. The things that went by good or bad is now over and a brand new book awaits to write another story, you could make history or be in bits and pieces and be forgotten. But the point is it is scary since you can’t foresee or predict. Sometimes what you thought would be right will not be what you actually wanted and sometimes what you felt will be terrible would be a boon instead. So all in all, although change is scary, it is necessary and it depends on what we believe. Every time a new beginning ends we have mixed feelings about what went by, introspection, permutation and combination of what ifs. A few months back multiple new books opened and old ones closed, personally and professionally. While I thought that the bad days had gone and good days had finally arrived, I realized that it isn’t how I had expected it to be, my inner self-wasn’t calm, while I had many reasons for it be. Then I realized that many times just a chapter closes and not the entire book, and the chapter depends on how we decide to make it. Good or bad, positive or negative depends on our perspective. If we choose to see only the negative side of things then simplest and purest of things which earlier made us happy also would now feel terrible. I began to see life differently, neither was I nor am I an overly positive person but at times when I feel low, I chose to see the bright side of things, restoring my inner peace to normal. How do you keep yourself intact? Are you peaceful inside if so how do you arrive at that state? Rightly said. Never be too positive nor too negative. Just live the moment happily that also helps you restore the inner peace in you. Well said Ramya! I was also one of them who feared the change in life but not anymore. I learned that change can be good and show us new opportunities! It is difficult to adjust to change initially. I crib and cry even go to social hibernation. But I make myself get back to normal. Because whatever happens it’s for good, I believe in that strongly. Long ago, when a not so good change commenced in life, I kept saying to myself that, Whatever happens move on with a smile. And it really helped me. I try and welcome change no matter how trying it is. One of my mentors always used to say that giving birth to a new life is painful, however, the end result is always beautiful. I always remind myself of these words when I am going through something I have never experienced before. Excellent food for thought, Ramya. Sometimes end of road may be beginning of a new one because you may have to take a turn and start all over again. But it might be in our best interest. Cul-de-sac may delay but they can’t stop a determined person. Change is the only constant in life. Positivity really helps to cope up with changing scenarios. You have expressed it very aptly Ramya. Somebody once said “a change is as good as a rest. I think it’s important to embrace change, otherwise, we become stagnant. It can be stressful at times, but worth it in the end. You’re so right about concentrating on the positives and not the negatives.